Gravitational-Wave Announcement Coming on Oct. 16: What Could It Be? 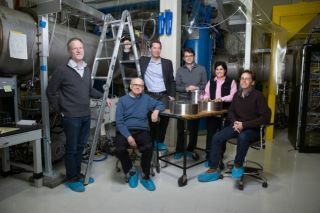 Members of the MIT LIGO team (from left to right): David Shoemaker, Rainer Weiss, Matthew Evans, Erotokritos Katsavounidis, Nergis Mavalvala and Peter Fritschel. Rainer Weiss stated on Oct. 3, 2017 that the LIGO collaboration will make an exciting announcement on Oct. 16. There's a big gravitational-wave announcement coming later this month, but insiders won't reveal any details. We've made some educated guesses about what will be revealed reveal. Yesterday (Oct. 3), three physicists with the Laser Interferometer Gravitational-Wave Observatory (LIGO) collaboration were awarded the Nobel Prize in physics for their work in making the first-ever direct detection of ripples in space itself, created by black holes merging together. At a news conference at the Massachusetts Institute of Technology yesterday, co-prizewinner Rainer Weiss said the collaboration will make another exciting announcement on Oct. 16, but he wouldn't say what it was. A reporter later asked Weiss to expand on that comment, but he declined to provide more details. "I can't tell you any more than I did," he said. "I'll tell you why: It's not fair to the people that prepared it all. I was giving you a teaser, like a circus, a guy who stands in front of the circus show." A LIGO spokesperson we contacted for this story also declined to release any details. But just for fun, we speculated on what the Oct. 16 announcement could be. LIGO's two detectors — located in Hanford, Washington and Livingston, Louisiana, respectively — made the first-ever direct detection of gravitational waves in September 2015, and the collaboration announced the finding in February 2016. More than 100 years ago, Albert Einstein predicted the existence of gravitational waves in his theory of general relativity, in which he showed that space isn't a fixed backdrop for the universe. Rather, Einstein said, it's more like a fabric that is intimately linked with the passage of time (a concept he dubbed "space-time) and that can be curved and warped by massive objects. A black hole or a star curves space-time like a bowling ball on a rubber sheet. Two moving objects can create waves in space-time. Thus far, LIGO has detected four gravitational-wave signals. All four have been created by two black holes orbiting each other and merging. LIGO has detected another pair of merging black holes (the least likely possibility, based on Weiss' comments). It has detected gravitational waves coming from something other than black holes (most likely neutron stars). Scientists have pinpointed the source of one of those previously detected black-hole collisions by identifying an associated light signal. LIGO has found two merging neutron stars and also identified their source location. Now, let's examine those possibilities. While nothing is certain, Weiss' comments seemed to indicate that the announcement would be unlike anything LIGO has announced thus far. Part of LIGO's success was to confirm that gravitational waves exist, and Weiss mentioned "the future" of the experiment beyond an initial detection. He also said there is "more there" than a detection. That would rule out another black-hole collision. Scientists anticipate that LIGO will detect gravitational waves from pairs of neutron stars, the incredibly dense cores of stellar material left over after some stars run out of fuel, collapse and explode (also known as a supernova). Gravitational waves would provide new information about these incredibly dense objects. Another comment from Weiss hinted that this may be the case. "We've seen black holes, which is already wonderful," he said. "We also expect to see the merger of neutron stars, and that was a thing that actually gave this field a certain credibility when it was discovered that there were pairs of neutron stars in our galaxy, and people stopped laughing at us when that was found out. Now, the big question is, how often does that happen, that two neutron stars smash into each other? Well, I won't say any more." By "I won't say any more," Weiss could mean he doesn't want to accidentally spill the beans about the Oct. 16 announcement. The third and fourth possibilities involve locating the source of a gravitational-wave signal. LIGO scientists can determine if a gravitational-wave signal comes from black holes or neutron stars based on various characteristics of the waves. But LIGO cannot pin down the exact source of the signals it detects. That's been improved somewhat thanks to the Virgo gravitational-wave detector in Italy (a joint effort between Italy and France), which began taking data in August after completing a major upgrade. That same month, Virgo detected gravitational waves from a black hole merger that was also detected by LIGO. (The collaborations announced the detection on Sept. 27.) Together, the two LIGO detectors and the Virgo detector can narrow down the source to an area of about 60 square degrees on the sky, which is about 10 times better than LIGO can do on its own. The collaboration is also hoping that light-based telescopes might be able to locate the source of a gravitational-wave signal by detecting an associated light signal. Some neutron stars can be extremely bright, especially a type of neutron star called a pulsar, so it's possible that traditional telescopes could identify a light signal from two merging neutron stars. Black holes are (as their name suggests) entirely dark, although some black holes are surrounded by secondary material that radiates light, potentially revealing the location of these dark monsters. Though scientists at more than two dozen observatories were alerted to the LIGO-Virgo detection in August, collaboration members stated that no associated signal was found. The final possibility is that LIGO (and possibly Virgo has detected another gravitational-wave signal and that one of the light-based telescopes has spotted an associated signal. Some aspects of Weiss' comments may hint at this possibility. For example, when Weiss said the "real payoff [of LIGO] is going to be in the future," he could have been alluding to "multi-messenger astronomy," which refers to the study of cosmic objects by collecting multiple forms of information from those objects, such as light and gravitational waves. This could also include things like neutrino emissions (subatomic particles known to be emitted by things like supernovas). One of the long-term goals of LIGO is to enable multi-messenger astronomy, thus allowing researchers to learn more about cosmic objects than they could with just one type of emission. Do Weiss' comments indicate that multi-messenger astronomy has arrived? Did a light-based telescope spot the source of a gravitational-wave signal? We won't know until Oct. 16, but be sure to visit Space.com then to find out!